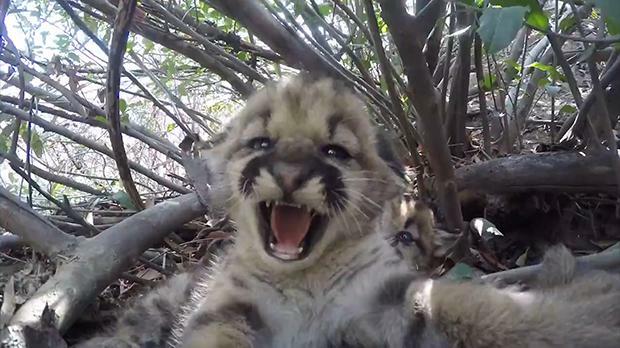 Mountain lion researchers found a litter of adorable cubs in the Santa Monica Mountains. They filmed their discovery and posted it on Facebook for the world to see. You can get right up close and personal with the lions from the safety of your computer. They even left the sound on so you can hear the little cubs purring. One does hiss when the camera gets too close - but that's hardly frightening. The Santa Monica Mountain Ranger Zack posted on Facebook: "Last month was a big one for our mountain lion researchers. "They found a total of five kittens in the Santa Susana Mountains! P-48 and P-49 were born to P-35. And P-50, P-51, and P-52 to P-39. In both cases, P-38 is suspected to be the father. "It's great that our local big cats are reproducing, but these kittens will face challenges as they grow up, from roads to rat poison to males finding their own territory." Some people asked about the humans disturbing the den. Ranger Zach put them at ease, saying: "We do our best to minimize disturbance of dens by sending only one researcher to locate and capture the kittens, and then carry them to a work-up area about 100 meters away. "Nonetheless, mountain lions and their keen sense of smell likely notice some disturbance to their den site. In the case of P-39, we got a glimpse into what happens upon return, thanks to the camera trap we placed there, and the first thing she did was to nurse the kittens. 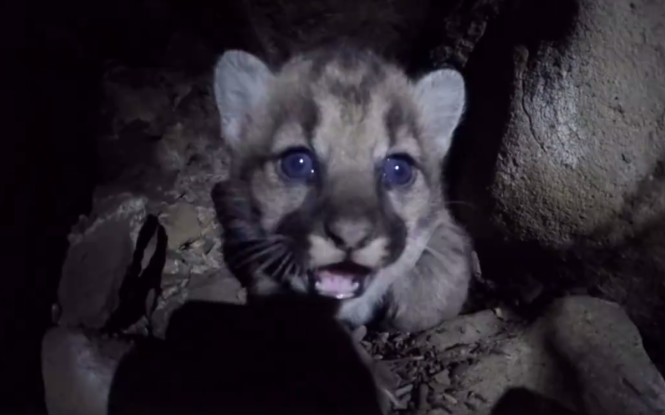 Responses to "Five Newborn California Mountain Lion Cubs Explore Their Surroundings"